Day laborers – individuals who line the streets across the country on a daily basis looking for work in low-paying, low-skill professions – are becoming increasingly visible throughout the United States and are perhaps the most vivid example of our government's failure to adequately enforce immigration laws. The Los Angeles metropolitan area alone has more than 27,000 day laborers on about 125 street corners on any given day. According to one expert at UCLA, day laborers are overwhelmingly Hispanic, recently-arrived, and in the country illegally; little over one percent of day laborers are either U.S.-born or of a non-Latino background. As municipalities continue to hear complaints about harassment, public drunkenness, traffic violations, and other crimes attributable to day laborers, local governments have acted creatively to reduce conflict and lawlessness. In an attempt to discourage some of the problems related to day laborers, Arizona legislators wrote a bill in 2010 that was later incorporated into Arizona's S.B. 1070. The constitutionality of the provision was brought into court and this week the Ninth Circuit Court of Appeals affirmed a preliminary injunction barring its enforcement. Ariz. Rev. Stat. § 13-2928(A)-(B). According to the court, state representative John Kavanagh, the provisions' principal legislative sponsor, said at committee hearings that the provisions would promote traffic safety but would also discourage the "shadow economy" of day labor and address illegal immigration because "[a] large number of these people are illegal immigrants and this is the way they get work, and this work is one of the anchors that keeps them in the country." The act of day laborers seeking out work in the middle of the street is appropriately analyzed as commercial speech, a position that I and other researchers have been arguing for years. The Ninth Circuit did approach the issue from a commercial speech angle, but seems to have stumbled on a key part of the analysis. Simply put, the Supreme Court has previously explained that commercial speech may be defined as someone communicating "I will sell you X at the Y price." Unlike most speech, however, the Constitution accords a lesser protection to commercial speech than to other forms of expression. The protection available for a particular commercial expression turns on the nature of the expression and of the governmental interests served by its regulation. "We evaluate restrictions on commercial speech using the four-part test from Central Hudson: (1) if the communication is neither misleading nor related to unlawful activity, then it merits First Amendment scrutiny as a threshold matter; in order for the restriction to withstand such scrutiny, (2) the State must assert a substantial interest to be achieved by restrictions on commercial speech; (3) the restriction must directly advance the state interest involved; and (4) it must not be more extensive than is necessary to serve that interest." The Ninth Circuit explained: "The proposal of an illegal transaction is… categorically exempted from First Amendment protection because it lacks social value." Nevertheless, the key finding from the court, as articulated in one section's headline is this: "Day Laborer Solicitation Is Neither Misleading nor Related to Unlawful Activity." I would counter that an illegal alien who is posing as a legally-employable legal resident while seeking employment is engaging in misleading speech and that the commercial speech is clearly aimed at an unlawful activity: the illegal employment of an illegal alien. The court does not appear to have considered this perspective. The 9th Circuit reasoned that Arizona is in the wrong "because it is legal to hire or be hired for day labor." The court completely misses an important fact: the day laborers are likely illegal aliens. In actuality, it is not legal to hire a day laborer who is in the country illegally. But the court myopically looks only at the manner in which the seeking of employment is taking place (i.e. flagging down drivers from the roadside, or middle of the road). The court held that Arizona's day labor provisions "regulate speech proposing a legal transaction where the speech is conducted in an unlawful manner" (emphasis added). Here, the court buys into the arguments from the illegal aliens' attorneys that Arizona is attempting to prohibit legal commercial speech by going after traffic violations. 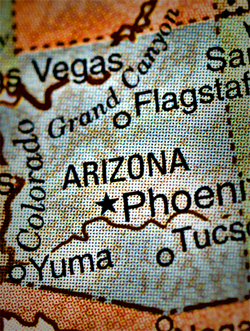 The court explained that Arizona could not "use a content-based law to target individuals for…punishment because of the message they convey while they violate an unrelated traffic law." In other words, the court and the plaintiffs believe that Arizona feels it cannot go after the speech, so the state is unconstitutionally attempting to stifle free speech via traffic laws. The court also explained that "in deciding whether to apply a categorical exception, we look to the content of a communication rather than the method of that communication. Here, the content of the communication — the solicitation of labor — is perfectly legal." But the court fails to analyze this issue with any great depth. The concept of "solicitation of labor" is very broad and not all solicitations would necessarily be considered "perfectly legal" by a court. Take prostitution, for example. Like the day labor at issue, it might be a roadside solicitation where a self-employed laborer is offering to "Sell you X at the Y price". The court's simplistic analysis missed a critical issue. Again, speech aimed at an illegal ends is not constitutionally protected, and the state can prohibit such speech. Unfortunately, the court failed to adequately addresses this very significant, threshold matter. Perhaps the U.S. Supreme Court will take up the matter and provide an honest analysis of whether the commercial speech of illegal aliens aimed at illegal employment is constitutionally protected.